Will Main Street Be Unique? Jul. 19, 2013 5:00 a.m.
Wetaskiwin – The design of the revitalized Main Street is different. But is it unique? Standing by the Royal Bank and looking east, I don’t see anything that will ‘awe or astound’ and be a driving force that will entice businesses to locate there or attract outsiders to visit that street. Envisioning Phase II, west from the TD Bank the historical buildings will add character to the streets but I still don’t foresee any ‘awe or astound’ value to inspire new businesses to locate there. It’s a chicken and egg problem; businesses attract people and people attract more businesses. Having recently returned from another trip to Eastern Europe and visited another dozen major cities I noted almost all of them have a Market Square. This is an area in the centre of the city that has been established as a meeting place and often features historical buildings, monuments or both. Over the years retail shops, pubs, restaurants and entertainers (buskers) have located in or around the Market Square, making it the most sought after location to visit by locals and tourists. Cities without a typical Market Square have created one. They block off each end of the street and place benches and planters down the centre of the street turning it into a pedestrian walkway. Whether temporary or permanent the Market Square provides a location where locals and tourists can gather for special events or simply to walk up and down the street and check out the shops and restaurants. Canmore proves this can even be successful even in the winter. Each spring, they close down their entire Main Street for a 2 week period and host a winter festival. The street is covered with about 40 cm of snow and when the activities such as dog races, cross country skiing, and winter bike riding take place, the entire street is lined with spectators and participants. 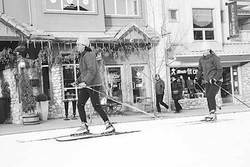 Street hockey, ice carving, log sawing, and snow sculpting events all take place in downtown Canmore throughout the carnival. Now that is Main Street uniqueness. O.K., so I know this won’t happen but I can envision how a unique concept can be more attractive to potential businesses than concrete and fixtures. Its one thing to say ‘let’s build a pretty street and they will come’ but its more effective to provide something value-added to that pretty street. This is one person’s opinion.